Facebook has started testing Lead Ads, and they are awesome. It shouldn’t take long for advertisers to realize just how useful, powerful and ultimately profitable these new ad units may be. 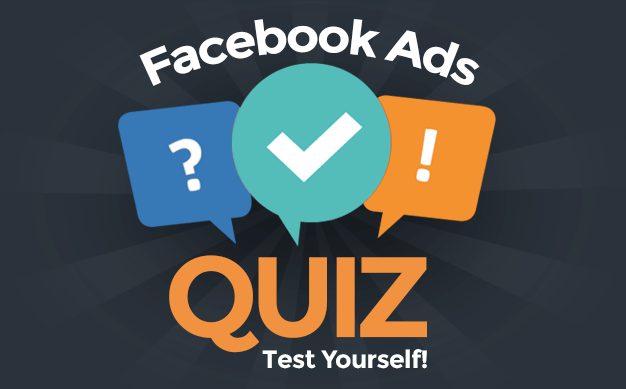 Facebook has started testing Lead Ads, and they are going to be AWESOME! Building an email list is imperative to any business. But the process of building that list through forms can be cumbersome. 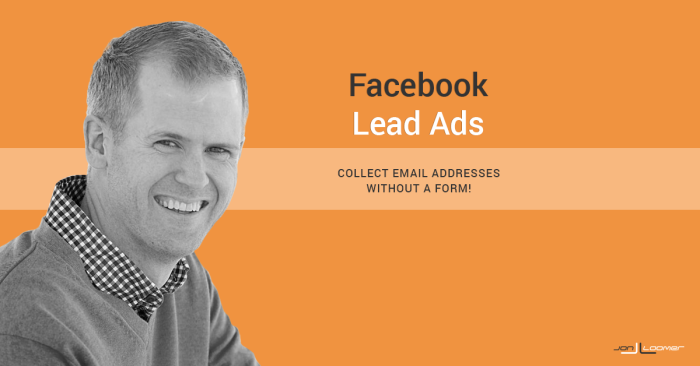 With Lead Ads, contact information users give to Facebook, including email addresses, will automatically populate. It’s now two simple taps. First click the call-to-action button, like “Subscribe,” and then confirm by clicking “Submit.” No more manually filling out forms! Marketers have historically needed to be careful about requesting too much information. Generally, the more information requested, the fewer forms are completed. But that may be less the case now with Lead Ads since that information will be auto-filled for the user, taking the labor out of completing these forms. There are so many opportunities for a user to lose interest, get distracted or decide not to fill out that form with this process. 1. The user may not want to click a link that redirects them away from Facebook. 2. The load time of the landing page might be slow, preventing them from waiting for and completing the form. 3. The information on the landing page may not be presented clearly. 4. The advertiser may be requesting more information than the user wants to complete. Lead ads will solve this bottleneck. While mobile is great for engagement, many advertisers see a lower conversion rate. It’s just not nearly as easy to complete forms from a phone than it is from a desktop. The invention of the Lead Ad solves this problem in a big way. Not only is the user now not redirected to a site that may not be mobile friendly, but two taps is all it will take to complete the form. When Facebook does anything awesome, the question of privacy inevitably comes up. Just know that it’s not an issue here. 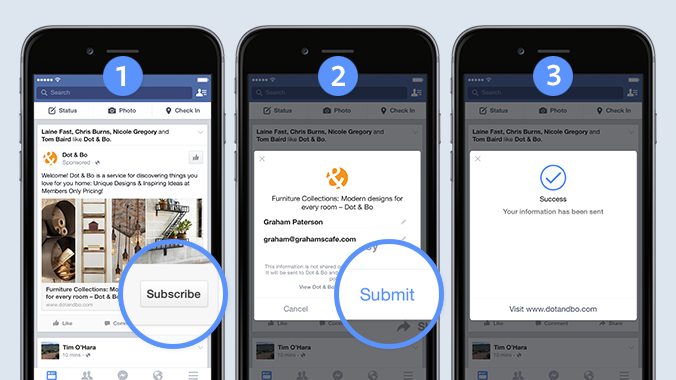 When using Lead Ads, Facebook pulls this information from a user’s profile, and it isn’t sent to the business until the user clicks “submit.” So it won’t be sent without the user’s approval. Lead Ads follow the trend of Facebook innovating products that keep users on Facebook. Instant Articles allow users to quickly and easily engage with articles without being redirected to a slow website. And “Buy” buttons allow users to make purchases without ever having to leave Facebook. These are great developments for user experience. Each process is significantly simplified and improved, likely leading to a higher conversion and engagement rate. But is this at a cost? By not sending users to a publisher’s website, they aren’t interacting with other content while they’re there. And this also doesn’t allow advertisers to add them to important Website Custom Audiences. While true, I can’t help but think the tradeoff will be worth it. But time will tell. Will Conversion Rates Go Up? Assuming users are comfortable with this new method, it’s difficult thinking of a scenario where conversion rates don’t go way up as a result. No more clicking a link to an external website. No more waiting for a page to load. No more completing forms. What’s not to like? Users are bound to love this. If conversion rates go up, these ads will be in high demand. As a result, Facebook may charge more to use Lead Ads. Like anything else, though, that additional cost is acceptable as long as it’s in exchange for increased conversion rate. Right now, the Lead Ads test is currently limited to a small group of advertisers around the world. Unfortunately, it’s not clear if or when this will be launched officially and rolled out globally. Patience, my advertising friends. Patience. What do you think of Lead Ads? Any potential issues you can think of?